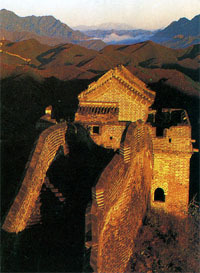 The Great Wall is the symbol of the nation of China. Hebei Province ranks first in China in the length and preservation of the Great Wall, with more than 2,000 kilometers of the Great Wall built in the Ming Dynasty. 286 passes in various sizes and more than 20 well-preserved sections. The Old Dragon's Head where the Great Wall elliptic, into the sea, Shanhaiguan Pass (or No. l Pass Under Heaven), the Great Wall at Jiaoshan. Jiumenkou and Jinshanling, Dajingmen-a strategic fort on the Great Wall, and the Great Wall on water at Panjiakou are all located in Hebei. Only viewing the Great Wall in Hebei, can people realize how long and how magnificent the Great Wall is. The Great Wall tour promoted by Hebei Province has been warmly received by domestic and foreign tourists with its rich and varied contents.